However the weapon data is required when signing up for a match. The SORS system stores complete information about a particular shooter's weapons. 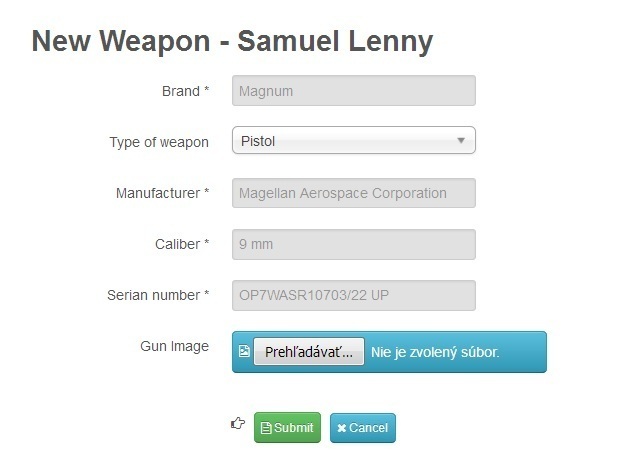 The shoter on the race list can choose the weapon from his list, which he / she will take to the match without having to record the details of the gun in the registration form. It saves time and creates the comfort for the shooter. Registration of shooter weapons in the SORS system is not mandatory. Since of sensitive information (arms), access to these data is strictly specified in the SORS. Only users with MANAGER privileges have access to all data. In the group manager, users such as club presidents (who organize races and need information on firearms for races) or TOP management (president, vice-presidents ...) depending on which specific rights are assigned to them by ADMIN. How to register a weapon to the SORS System. At the first you need to sign in to LOGIN FORM to system SORS. Then click on the MENU - THE WEAPON LIST OF SHOOTERS, where at the bottom is the green button INSERT WEAPON. A form appears after you have filled in, which have to be saved. A registered shooter can register as many weapons as he sees fit in. Each weapon inserted is automatically assigned to his user account.